This is a fool-proof elegant soup. I have served it in small cups as a first course of Christmas Dinner or in big rustic bowls with lots of good bread and cheese for a light meal. 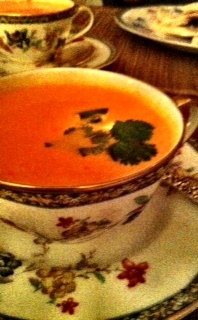 This entry was posted in Recipes and tagged Cream Soup, Red Pepper, Saffron, Shrimp. Bookmark the permalink.